Though you may use any shipping method and carrier, for optimum security we recommend sending packages registered and insured through USPS mail. Please note that registered packages must be bound with non-glossy tape to ensure that postal seals do not rub off. We pay your shipping ! ! ! 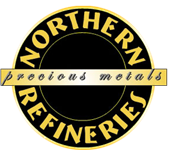 Special Instructions: Upon shipping material I warrant to NORTHERN REFINERIES LLC that any material offered for refining and sale is submitted with clear legal title. Important: Include your name, address, phone number and e-mail address (if available), and driver's license or state ID with the package. If your settlement is over $8,000 you can choose between a free one-ounce silver coin or free shipping. Remember to include your coupon.